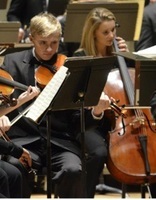 The Valentine's Day Concert, preformed by the Harrisburg Youth Orchestra will be held in Harrisburg, PA's forum February 11, 2013 at 7:00 p.m. The Harrisburg Symphony Youth Orchestra and Junior Youth String Orchestra musicians show their technique, learn challenging repertoire, develop discipline and a sense of teamwork. The Bridgeview Bed and Breakfast is conveniently located just a hop, skip and jump across the Susquehanna River, nestled in a beautiful country setting that escapes the city's hustle and bustle. Reserve a cozy private room and make The Bridgeview B&B your relaxation destination for central Pennsylvania area by calling 717-957-2438 or visit our website! Also be sure to look at all of our great guest comments on, a href=http://www.tripadvisor.com/Hotel_Review-g53125-d1468731-Reviews-Bridgeview_Bed_Breakfast-Marysville_The_Alleghenies_Pennsylvania.html> Trip Advisor . Check out our Facebook page for pictures, daily updates, and even more guest comments! Now Here's a real Heritage Unit!! There's been a lot of excitement about heritage units lately. Railfans track and chase them like a big game hunter pursuing his quarry. Some have even been known to run barefoot in snow to get that "killer shot" of their favorite Heritage Loco! Pictured here is a real Heritage Unit, Norfolk Southern 2101, a true survivor! This locomotive started life in 1973 as Reading 2609 an EMD produced SW1001. It became Conrail 9409 in 1976, and NS 2101 in 1999. Ironically, the NS number allocated to this engine is the same one assigned to a Reading T-1 Steam Locomotive that also still survives! 2013 marks the 40th year of service for the 2101, and we would like to wish her a Happy Birthday!! A lot of different and unusual locomotives pass through the Enola Diesel shop. There's no better place to stay for viewing Enola PA action than The Bridgeview Bed & Breakfast. See why railfans make The Bridgeview B&B their lodging choice for Central Pennsylvania especially the Harrisburg PA area. Check out www.bridgeviewbnb.com for a virtual tour and call 717-957-2438 to reserve your room!! Historical data provided by The Reading Company Technical & Historical Society. The Bridgeview Bed & Breakfast Photography Hotspot!! There are unlimited opportunities for great photography at The Bridgeview Bed & Breakfast, the four seasons, sunrise, sunset, fog, snow, river, mountains, bridge, wildlife and nighttime!! Now that winter is here, there are many new and different opportunities to get that great shot!! Everyone loves snow pictures, and with the leaves off the trees there are more open spots for shots. 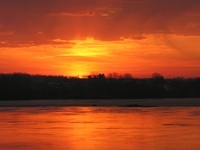 There's no better place to get some beautiful photos than The Bridgeview Bed & Breakfast where our view of the Susquehanna River, Blue Mountains, and the stone arch Rockville Bridge all combine for one amazing vista!! We are located the Harrisburg area of Central Pennsylvania. You can view some of our pictures on Facebook as well as daily updates and guest comments. See even more great guest comments on Trip Advisor . So call 717-957-2438 or go online to reserve your room, and let out your inner photographer! !